I bought my Roland TD-4 electronic drum kit to input midi drum parts into music I was recording on my computer. Drumming turned out to be a little more complicated than I imagined, so I had to work with some instructional DVD’s and practice some fundamentals. I got better, and a couple of times when my friend Craig Saxon came over to jam, I played drums instead of guitar. This worked fairly well, so Craig invited me to come and play drums at a couple of coffeehouse gigs in Camarillo. The electronic drums are very convenient to set up and transport, and it is easy to control the volume, so they work well for small venues like these. However, I started to want to play real drums. I ordered a GMS Subway SL kit, which is a small kit designed to fit in small cars and not be too overwhelming. Unfortunately, it is backordered with no clue about when it will be available. In the meantime, I had to buy cymbals, so I set out to learn about them. The Big Three brands are Zildjian, Sabian (which split off from Zildjian) and Paiste. 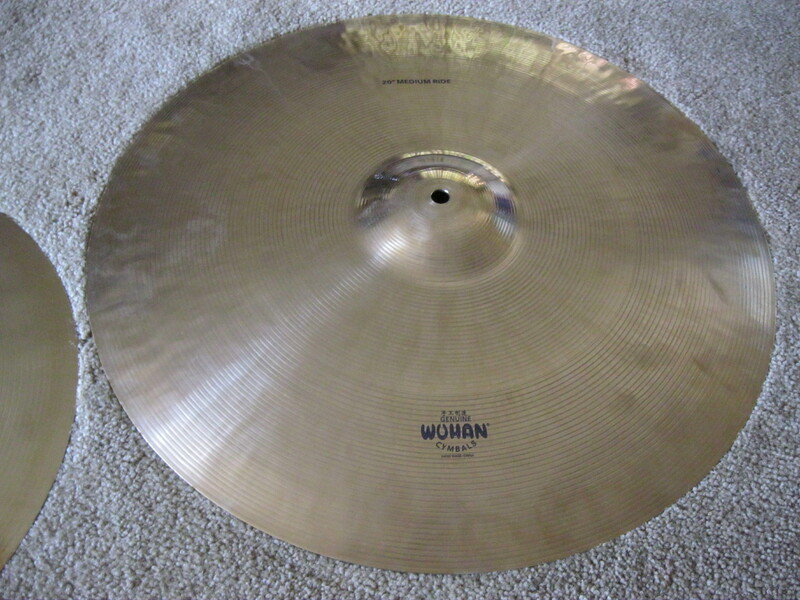 Entry-level cymbals are usually made of B8 alloy, which is easy to work and can be cut out of sheets. Professional cymbals are made out of B20 alloy, with 20% tin. This is much harder to work, but sounds much better. The best cymbals are handmade, and very expensive. 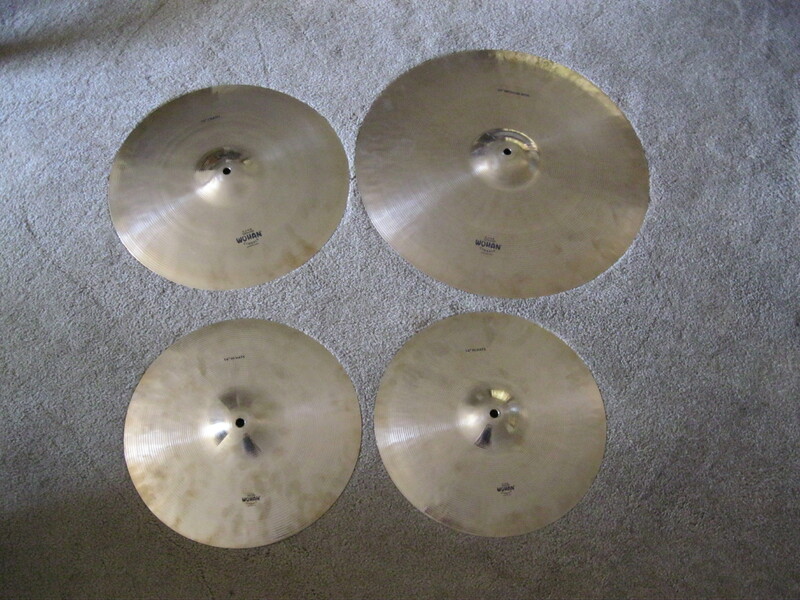 A ride cymbal, a crash cymbal, and a set of hi-hats could easily cost $1,000 new. Most drummers buy them used, and want to play the cymbal before they buy. Handmade cymbals all sound different. I don’t have cymbal stands yet (they are supposed to come with the GMS Subway SL), so when I got these, I set the ride and the crash up on the TD-4 rack. That didn’t work for the hi-hats, so I haven’t done much with the hats. I must say that after hitting the rubber pads on the electronic kit for a year or so, hitting real cymbals was quite overwhelming. I had gotten used to hitting the pads pretty hard. It took me a while to adjust to the volume of real metal. I wanted to see how the ride and the crash sounded with other instruments. In the following clip, I am playing the acoustic cymbals with an electronic kick and snare, thus the recording is less than ideal. The bass is my Douglas Hofner Beatle Bass clone, and the guitar is my Xavier Telecaster clone on the neck mini-humbucker. I did each instrument in one take, so there are mistakes. My aim was to hear the cymbals in context. The whole thing ended up with a sort of Doors vibe. The cymbals were recorded with a pair of GLS ES-57’s, which are clones of the Shure SM-57. So the bass, the cymbals, and the microphones are Chinese, but the guitar is Korean. At about 1:58, I start riding the crash and hitting the bell on it. At 2:30, I switch back to riding the ride cymbal. It is interesting that the 16″ crash has a lower-pitched stick sound, but a higher pitched bell, than the 20″ ride. Comments about the cymbal sound are welcome. Are the wash overtones musical? That is the question. This entry was posted in Music and Guitar and tagged cymbals, Wuhan. Bookmark the permalink. Welcome to my blog! I was worried when you stopped posting on yours, but I see you were in Nepal. Drums are fun, but I am at the point where I realize how much work it will be to actually be good. I am still working on it though. Thanks for posting!